The Danner 50132 Tachyon 8in USAF Sage Green Tactical Boot Is one of the most sophisticated boots to hit the military uniform boot market. This book was designed for US Air Force personnel looking for an ultralight weight, athletic style uniform boot that is ideal for physical activity to include running, crawling, jumping, and rope rapelling. this good features a complete synthetic ultralight upper for incredible weight savings which makes this 13 ounce boot one of the lightest on the market today. An abrasion resistant toe protects this boot from scuffs tears and punctures. A lightweight EVA midsole provides high impact shock absorption for maximum comfort and reduced fatigue. 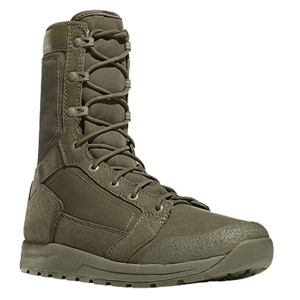 This boot is approved for wear with the US Air Force Airmen Battle Uniform. Awesome boots. Feels like you're walking on air. When I got these delivered to my house, i picked up the box and thought only one boot was in the box. That's how light these thing are. My running times are definitely faster thanks to these. When I got these boots I was excited because they are incredible lightweight ans super comfortable. I'm in the Army and every soldier needs a pair of lightweight boots for rucking. I've worn Nikes, Rockys, and SWATs in the past but they just don't hold up to day in, day out rucking which I understand it pretty toiling on your boots. I was hoping for something better from Danner but after about a week of trekking through some dense terrain and includes, the sole started to separate from the boot. A little bit of Goop fixed the problem but they're not as durable as I'd like them to be. These boots were suprisingly light as noted by other reviews. I think they're even lighter than my asics running shoes. Anyways, I'm happy with how comfortable they are and they seemed priced well. I do a lot of walking on pavement and they are great. I'm glad I decided on the Danners. My regular shoe size fit like a glove. These Danner Tachyons are literally the lightest boots I've ever worn. I was amazed and how light they were. In fact, I weighed them on an electronic scale and they came in at 13 oz for a size 8. As for comfort, they're pretty comfortable. Not the most comfortable boot I've ever worn but I understand there has to be some type of compromise for the extremely light weight. Anyways, I like these more than my Minimils and they offer more protection at a lighter weight. Like other reviewers, I coulndt believe how light these were when I picked up the box. Great boots right out of the box. comfortable. The sole is a little slippery on wet surfaces and the rubber isn't too grabby. I imagine everything on this boot is synthetic to get it to this weight. Other than than. These are great! I've had these for a week and so far, so good. They're really light but I'm not sure how well they will hold up over time. The build of these doesn't seem too rugged. I've worn boots in the military and these just dont seem to be of the same toughness or quality. Only time will tell though but I'm skeptical. Oh yeah, they ran true to size.